Samba Sunset online slot is a 3D game inspired by the Brazilian Carnival of Rio de Janeiro. There’s more than meets the eye about this visually charming key with 243 winning combinations. Its five reels are populated by symbols that will make you feel like you’re right in the heart of the South American festivities. Released in anticipation of the reels 2016 Olympics, the game has emerged as a popular slot on both desktop computers and mobile devices. The return to player exceeds 96%, making Samba Sunset slot one of the best paying games produced by Realtime Gaming. If you’re in the market for jackpot games, this one will meet your expectations with potential payouts of 4.500 coins. The net amount depends on how much players actually bet, as the betting limits are accommodating. Bet as little as 0.01 coins and up to a full coin to get the party started. Samba Sunset bonuses are triggered by wild symbols appearing in the right sequence. The Samba Sunset logo serves this purpose and it can only appear on the second and fourth reels during the base game. Except for the scatter symbol, it will replace all other signs and trigger the bonus games. If scatter signs pop up before, then you can consider yourself truly lucky as 10 free spins are produced. Unveil the Samba Sunset logo during these bonus rounds and you’ll find out what Super Games stands for. This is a special feature introduced by Realtime Gaming to bump up the profits of Samba Sunset slot. Your winnings will be increased threefold, but you won’t be able to trigger additional free spins. That’s the time when those who bet larger amounts cash in on their willingness to gamble. Keep in mind that there are 243 different ways to win and a progressive jackpot that is randomly triggered. The samba dancers are at the cornerstone of this game, hardly a surprise given the name of the slot. Developers came up with an original concept and crafted reels that are nearly transparent, to make the most of the charming background. The decision to add playing card symbols is a bit questionable, but not enough to ruin the atmosphere. A bay and the games logo stand for the wild and scatter symbols. Who's Afraid of a Little Volatility? 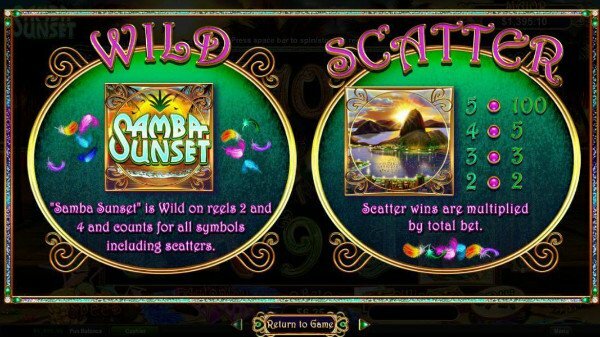 Samba Sunset online slot can be a bit of a handful for those were hoping for quick and often payouts. You might have to wait a while to hit those big winning combinations, but it’s definitely worth the wait. High rollers are probably going to care less about this aspect and will be more upset about the maximum coin size of 1 coin. A 25 bet multiplier is always there waiting to be triggered, so think twice before going for those tiny coin sizes. 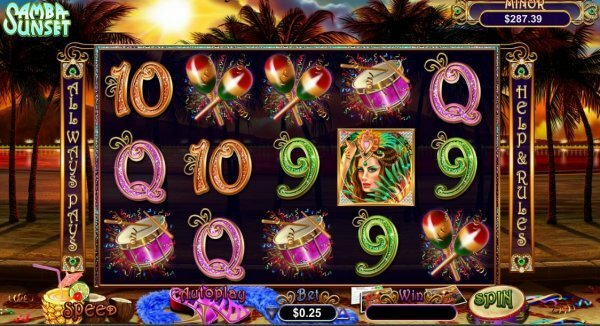 Despite offering many ways to win, as you can see from this Samba Sunset slot review, it is surprisingly easy to play. There are special features such as the auto-play that further simplify the mission of those who spin its reels. As they rotate, charming music will caress your ears and announce big winners. This tune will linger in your memory for a long time, probably just as long as the jackpot worth 4.500 coins. - Samba Sunset slot is built on an original concept and features charming graphics. - The original score perfectly matches the name and setting. - A 4500 coins jackpot is always looming in the background. - The game has above average volatility and few features for high-rollers.